The Sharks still weren’t the faster team at Las Vegas’ T-Mobile Arena Saturday. And into the first intermission, Golden Knight goaltender Marc-Andre Fleury remained the best player on the ice, saving all seven San Jose shots on goal. After playing the second period to a plus-seven differential in their first-round sweep of the Ducks, it was a three-goal awakening from the Sharks in period two of Game 2 that gave San Jose a chance to split the first two in Vegas. Logan Couture winner 5:05 into the second overtime period allowed Team Teal to cash in on that golden opportunity. And now, after appearing dead in the water following a 7-0 throttling in Game 1, the Sharks return to San Jose with the advantage. 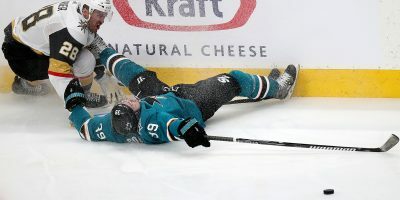 The proverbial worm turned in the faceoff circle where Joe Pavelski won six second-period possessions, four coming in the offensive zone, leading to two of the Sharks three second-periods goals. In total, San Jose was credited with 49 faceoff wins to Vegas’ 40 two days after losing 35 of 67 trips to the circle Thursday. Couture’s second goal of the night came immediately following a faceoff won by Tomas Hertl. It was the captain who gave his team the possession but it was Brent Burns who offered the scoring. Trailing 2-0 following William Karlsson‘s second goal of the night, a wrister that beat San Jose goalie Martin Jones to the glove-side 26 seconds into the second period, Burns launched from the point. With a diving attempt at a block, Vegas winger Pierre-Edouard Bellemare instead deflected Burns’ shot past Fleury. It was the Sharks’ first goal in 82 minutes against Fleury and the Golden Knights. Their first goal, coming off a power play faceoff won by Pavelski in the offensive zone, was followed nine minutes later by San Jose’s lone second-period score that did not come off of a Pavelski faceoff win. Instead, this one came in a four-on-four situation off of a poor decision by Fleury. The veteran net-minder chose not to freeze and force the faceoff following a Dylan DeMelo shot, letting play continue. But Hertl was the quickest one to the puck and his nifty pass through the crease found the stick of Couture to tie thing up with a one-timer. San Jose took its first lead of the series once again using a faceoff win by Pavelski. But this time, instead of Hertl flashy puck-handling, it was a heady decision by Burns. After backing into a set offense, as he had in each of Pevelski’s previous faceoff wins, Burns took possession and attacked taking just five seconds to move from the blue line around the back of the Vegas net and sliding home a wraparound to beat Fleury stick-side. The quick attack clearly caught the Vegas defense, which was setting as Burns flew in, by surprise. Much the way it did to Anaheim, the San Jose aggression forced the Golden Knights into overly physical defense. 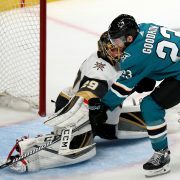 Serving just 10 minutes of penalty time in Game 1, Vegas was issued 22 PIM leading to two power play goals for the Sharks, including the game-winner. San Jose’s first lead of the series lasted nearly seven minutes into the third period when Nate Schmidt knotted things up to force overtime. 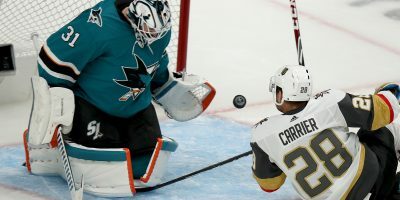 Jon Marchessault appeared to score the decider with 3:02 remaining in the first overtime period, but a review from the NHL situation room determined that Marchessault created contact with Jones in the crease, ruling goalie interference. 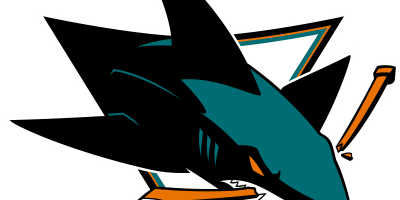 The Sharks and Golden Knights head north for Game 3 in San Jose’s SAP Center Monday night. The puck drops at 7 p.m. Following a rough Game 1, in which he was removed from the contest early in the second period, Jones was credited with 26 saves in Game 2. Fleury has now stacked 76 saves in the series, 43 in Game 2 alone. Shark defense man Dylan DeMelo was helped off the ice and directly to the dressing room after knee-to-knee contact on a hit by William Carrier 4:17 into the second period. Carrier was given the two-minute minor for kneeing. DeMelo returned to the game. 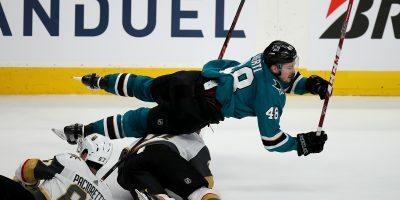 … San Jose center Tomas Hertl left the game near the midway point of the third period with an apparent facial injury after hitting Jon Marchessault. Hertl returned to the game. … The final three spots of the NHL Draft lottery were announced during the second intermission with the Buffalo Sabres, with the NHL’s lowest point total in 2017-18 (62, 25-45-12), claimed the No. 1 overall picks. The Carolina Hurricanes, who narrowly missed the playoffs (83, 36-35-11), claimed the second selection while the Montreal Canadiens left with the third pick. … Shark winger Evander Kane, serving a one-game suspension for a cross-check to the head of Pierre-Edouard Bellemare, will be available for Game 3 in San Jose.